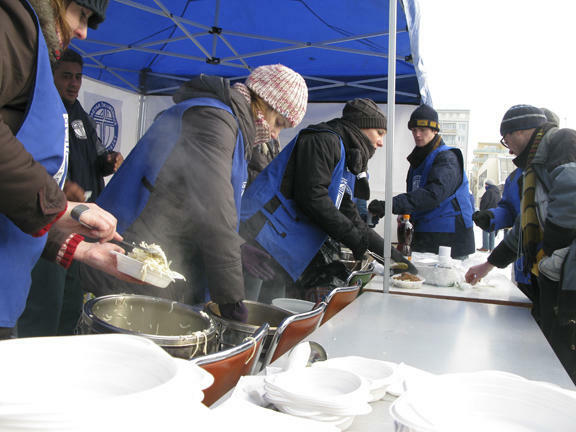 There’s lots of discussion these days among public policy leaders and government officials about poverty – what causes it, and what can be done about it. A new study aims to answer a different question – what are our perceptions of poverty, and what do those tell us about how to deal with the issue? Melissa Bernardin is director of the new Investing in Communities Initiative, which commissioned the research. She joined All Things Considered with more on the research. Melissa Bernardin of the Investing in Communities Initiative talks with NHPR's Brady Carlson. 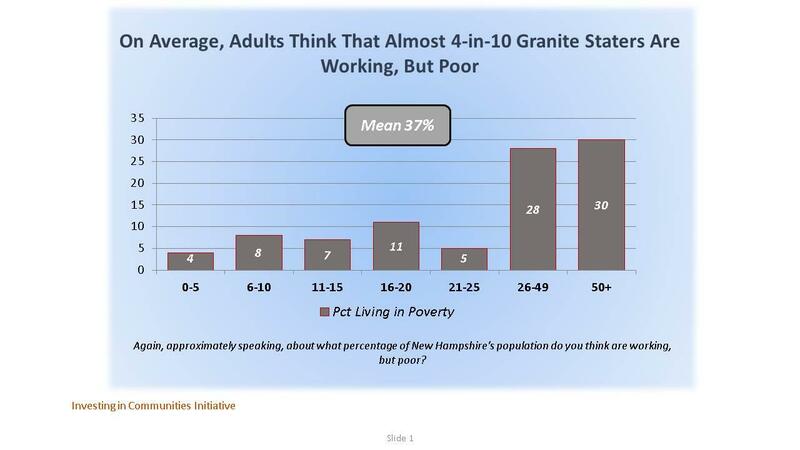 From the Investing in Communities Initiative report on the perceptions of poverty in New Hampshire. According to the US Census, about 8.7 percent of Granite Staters were living below the federal poverty line in 2013. The people who responded to the survey by and large thought that number was a lot higher. Do we know why? I think, when you look at the results, people see poverty as something very close to them - they may even be on the edge of poverty themselves. They're really worried about being pushed into poverty. It's what they see and what they experience among their friends and neighbors. When asked what portion of the state's residents they think are living in poverty, without an official measurement, they said more than a quarter - 27 percent of the state's population - was in poverty. And when asked to include the ranks of the working poor, they estimated that 37 percent of the state's population - almost 4 in 10 people - is working but poor. More people than official statistics capture really are feeling like they are that one unexpected car repair or that health care expense that they weren't expecting away from ruin. Are there particular demographic components that thought the poverty rate was higher than others? Does it relate to income, education, political affiliation? Or is it more or less the same across the board? More or less we saw a lot of commonalities among different demographics. We polled statewide folks age 18 and above and asked them to identify their party affiliation. We also looked at the data by income level. And generally the results did show similarities regardless of income. Does that carry forward through to perceptions of what drives poverty? On the causes of poverty, there were also lots of areas of agreement and convergence - low wages, lack of jobs, and cost of living, including health care expenses - as primary causes of poverty. We also interviewed legislators, almost 70 of them, to identify where there was agreement, or to see if their views were strikingly different than those of the public. What we found interesting on causes of poverty - and we tested a mix of economic factors along with things like personal behavior and actions - the research showed convergence among members of the public and lawmakers across party lines around lack of jobs and the high cost of living in New Hampshire. And perhaps because of those perceptions about the causes of poverty, the solutions these respondents proposed were also largely structural. New Hampshire residents want government to do something about the issue of poverty in New Hampshire. A majority of residents, 55 percent, said state government is not doing enough to address poverty, and lawmakers generally agree. In fact, 6 in 10 of the lawmakers we interviewed said state government is not doing enough to address poverty in New Hampshire. The research showed there is strong support for a variety of tools that pave the way to better jobs - people really see a need for job skills training and opportunities for educational advancement, an affordable place for their children to be cared for while they're at work, access to affordable transportation, and good jobs that pay a livable wage. What questions would you like to answer now that you've conducted this first round of research? I think it'll be interesting to see if, by finding common ground, we can move some policies forward in the state of New Hampshire. I think in politics it's about highlighting differences and proving that I'm right and you're wrong, but when it comes to public policymaking, in order to be successful you have to have shared understanding, if not about causes than at least about solutions. We wanted to use this research to help policy groups understand what people in New Hampshire, including legislators, think about poverty and what they think we should do about it. We wanted to know which arguments resonated with people and where there might be common ground on solutions. I think we'll be taking this research forward and seeing how it plays out in the public policy sphere. Poverty Under A Microscope In N.H. Following up on our homelessness show yesterday, we’re looking at the broader issue of poverty in New Hampshire. While the state has one of the nation’s lowest poverty rates, it doesn’t always do well on certain measures, like childhood poverty. We’re looking at the latest numbers, and some of the efforts to address the issue. Census Data: Fewer People Living In Poverty In N.H. 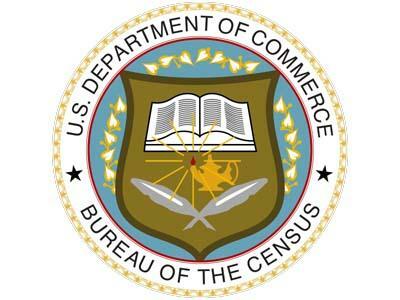 The U.S. Census Bureau is releasing new data that shows about 17,000 fewer people were living in poverty in New Hampshire in 2013 compared to the year before. The 1.3 percent decline from about 128,500 people in poverty in 2012 to roughly 111,500 last year is the second sharpest drop in the nation, trailing only Wyoming's 1.7 percent decrease. In New Hampshire, 8.7 percent of the population lives in poverty, compared with 15.8 percent nationally. The national rate in 2012 was 15.9 percent.